Tipheret's planet (body) is the Sun. Tipheret is at the center of the Tree. It is the point where the personality, moving up, first ventures into the realm of the soul. It is where spirit, descending, first 'splits off' and becomes physical. Tipheret is at the summit of the personal realm, as Keter is at the summit of the Transpersonal realm. It is where the mundane world meets the spiritual. Tipheret brings harmony and compassion to the world. Tipheret is where the "I" is. It is the director of one's personal drama. It is not aloof, but completely involved, bringing spiritual awareness into the mundane realm. It is the small "I," as Keter is the superconsious "I." In Tipheret, we meet our higher selves, and learn to sacrifice lesser desires. It is integration of the higher reality into daily life. The animal nature is below, the spiritual nature is above. Tipheret is Atman, the Spirit or Self, the immanent aspect of the Godhead. It is also called Jiva, the Atman identified with its coverings - body, mind, senses, etc. Because of Maya (Key 2), Brahman (Keter) is concealed from the individual soul. The choices made by the Jiva, or individual, are represented in the human incarnation, Temperance. The Golden Mean, or Golden Section, is a mathematical constant, a ratio that appears in nature and was discovered by Pythagoras in the 5th century B.C.E. This proportional ratio was used in art and architecture by the Greeks and has been used by artists ever since. It was first called "Sectio Aurea" (Golden Section) by Leonardo Da Vinci. This number, 1.6180339..., is the Greek "Phi," or . Like Pi (3.14156...), has no end. These are irrational numbers, whose infinitely long strings of decimal places never repeat. These numbers occur naturally and are used in all cultures with a mathematical awareness. The Golden Section can be demonstrated graphically by making a point on a line positioned such that the two segments it defines have the property that the short segment has the same proportion to the long segment as the long segment has to the entire line. 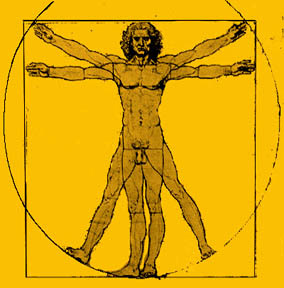 The Golden Rectangle, whose sides have a ratio of , is shown below. A Golden Rectangle is formed from a square like the red square to the left. One side is divided by half, at 'c', and an arc is drawn from b to e; e forms the corner of the Golden Rectangle. Both the green rectangle and the newly formed rectangle have the ratio. 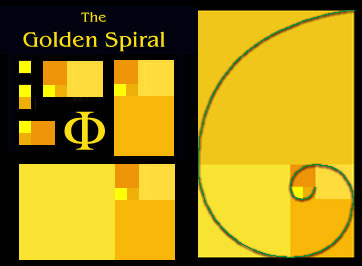 Golden Spirals are formed by nesting Golden Rectangles and then connecting an arc through the corners of the resulting squares. 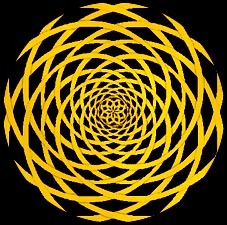 Multiple spirals, interlocked, create the familiar sunflower seed pattern. Rotation of plant leaves on a stalk follow the ratio insuring that the same position is not used twice, affording optimal exposure of underlying leaves to sunlight. Spiral seashells expand at the ratio, insuring that the partitions never align, providing optimal structural strength. The massive blocks used in building the lower levels of the Great Pyramid were overlapped by the ratio to optimize stability. The petals of many flowers are related to the diameter of the pod by . 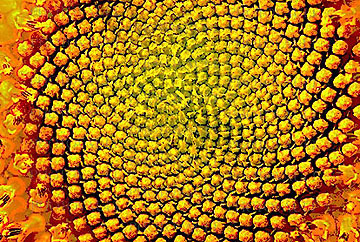 Spiral formations such as sunflower pods, pine cones, lettuce heads, and galaxies correspond with radius vectors generated by nested Golden Rectangles. The pentagram has been found to contain over 200 F ratios. The "Fibonacci sequence" is closely related to the Golden Mean. An example of a Fibonacci sequence is 1,1,2,3,5,8,13,21,34,55,... where each term after the second one is the sum of the two preceding terms. The ratio of each term to the previous one gradually converges to a limit of approximately 1.618, or . 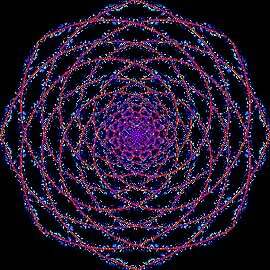 When graphed, Fibonacci curves start out rough and angular, but soon smooth out into Golden Spirals, or as near to them as is perceptible. 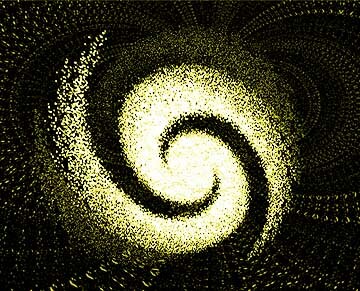 Paired Golden Spirals produce this galactic form. In his famous drawing, Leonardo daVinci (1452-1519) demonstrates that the length of a man's arm has a Golden Ratio to his entire arm-span. Tipheret is the Golden Mean, the point of balance. It connects macro to micro, through the Golden Spiral. The Fibonacci Sequence is the human soul, beginning rough, but developing into and converging with the Golden Spiral of nature. 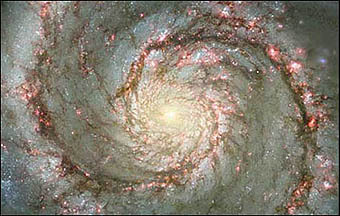 The Fibonacci Sequence is related to fractal geometry, discussed Key 3. The soul triad is composed of the primary colors. Tipheret, forming a triad with Chesed and Gevurah, balances the three forces: Severity (Gevurah), Mercy (Chesed), and Tipheret (Beauty). The three spheres form the triad of soul. 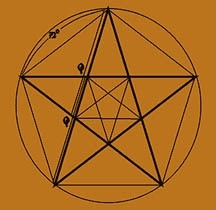 Potentials of Tipheret: Development of beauty, harmony, balance; centered consciousness, bringing soul into the life. Reaching balance between spiritual and physical forces. It is unlimited devotion, healing, freedom, meditation, realization, rebirth, redemption, spiritual ecstasy, transcendance, wholeness. The fragrance ascribed to Tipheret is Frankincense (Olibanum). It is associated with Apollo, Christ, Mithras, Krishna, Osiris, and Buddha, all avatars who experienced a transformation of some sort..
Commandment: Do not commit Murder.